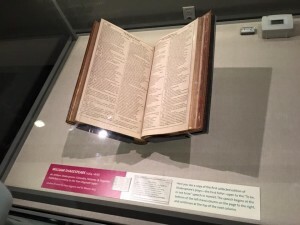 One of the few surviving copies of the First Folio, the book that gave us Shakespeare, is on display at the main downtown branch of the Seattle Public Library through April 17. As part of the celebration of this rare treasure, GreenStage will be doing two Backyard Bard performances of A Midsummer Night’s Dream. A Shakespeare First Folio is on display through April 17 at the Seattle Public Library downtown. Photo: Greg Scheiderer. Backyard Bard shows are abridged versions of Shakespeare plays, running and hour or less, and using just four actors. They fit well in places that can’t hold our full-length, full-size productions—places like small parks, or libraries! It is free to go and see the First Folio, but you do need a ticket, and they’re going quickly. Head to the library website to reserve yours today. Weekends seem especially busy, but we went yesterday in the early evening and had no trouble. The exhibit, which is in a fairly small space, can only hold a few people at a time. In addition to the First Folio, there’s a Third Folio and lots of information about the books and what they represent. Go see a play—and the First Folio!